This was my first time returning to Blogher since 2009, when it was much, much smaller! 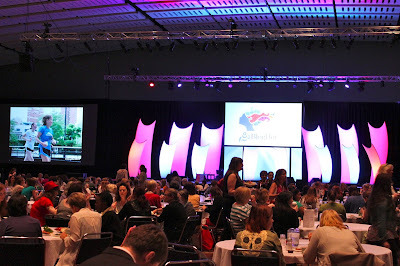 Read about my first Blogher experience here. I missed the keynote by Sheryl Sandberg because was under the impression that I only had an Expo Pass, and therefore saw no reason to head down for the keynote. Upon arrival, I learned I had a full conference badge, a horrible blunder on my part. 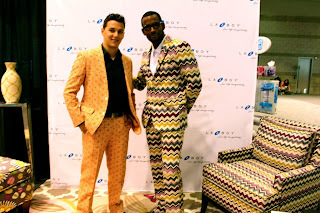 Dressed up in suits made of sofa upholstery, these guys were so fun. 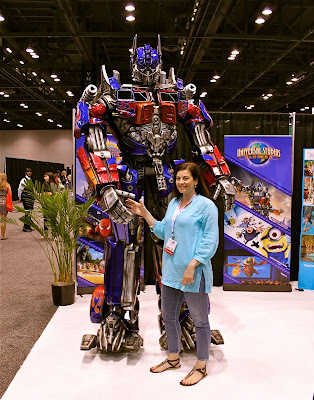 They were also quite knowledgeable about the products and the services offered by La-Z-Boy. 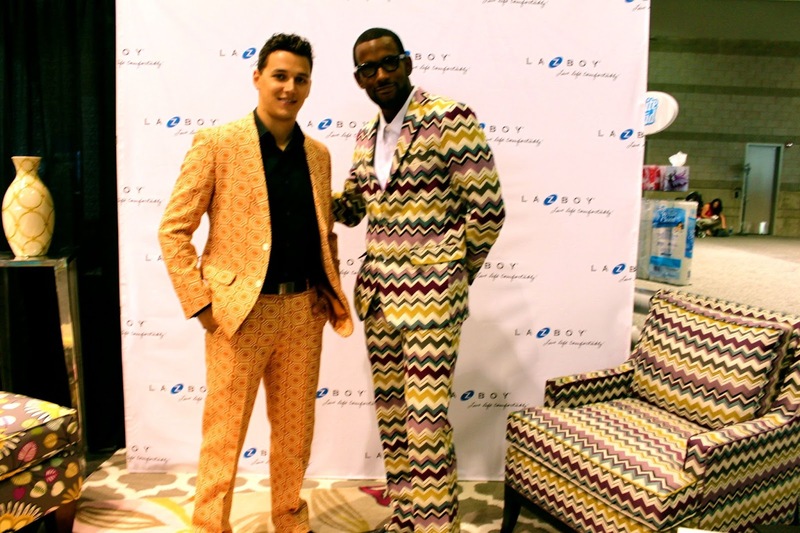 Did you know that La-Z-Boy will send a designer to your house and help you design your room? Including items that they don't sell, like wall coloring, etc. Pretty neat. I don't have a picture of the booth (it wasn't anything special), it was plain with staff sitting around and giving away stuff. 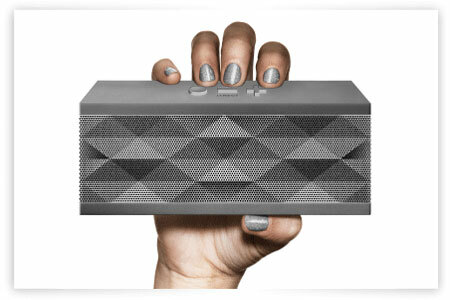 I'm not complaining because I won a Jambox by Jawbone! What is that you ask? An awesome wireless speaker that is (obviously) portable, and connects to your device via bluetooth. This was probably my favorite booth for two reasons: 1) Optimus Prime was a huge crowd pleaser and 2) I won another prize! I won a gift bag filled with Universal Studios goodies including Harry Potter James Potter's Wand (which is a big deal, from what I was told). 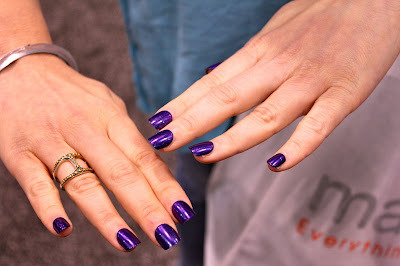 The imPress manicure booth was front and center, just after you walked into the Expo hall. They had haircare supplies (like blowdryers and flat irons) and they were giving manicures with their fancy press on nails (here's a link to their site). So many women had these fake nails on, and they look pretty good for a 5 minute manicure that sticks onto your nails and peels right off. Blurb has been a favorite of mine for years, a site where you can easily make your own books. I've written about their Instagram Photobook on my bachelorette party planning site. 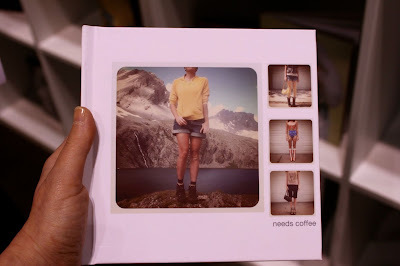 They had several products on display at Blogher - if you're interested here is 15% for an Instagram Book.